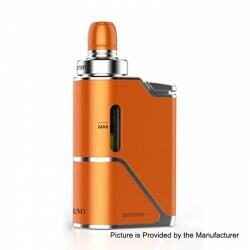 The Artery Uno Kit is an ultra-compact starter kit made from Aluminum and Zinc Alloy. It is powered by 1500mah built-in battery. The atomizer has 3.5ml of juice capacity and supports adjustable airflow. It is a great device for all starters.